The Grand Central Station in midtown Manhattan produces lots of radiation, and the granite is to be blamed for it. 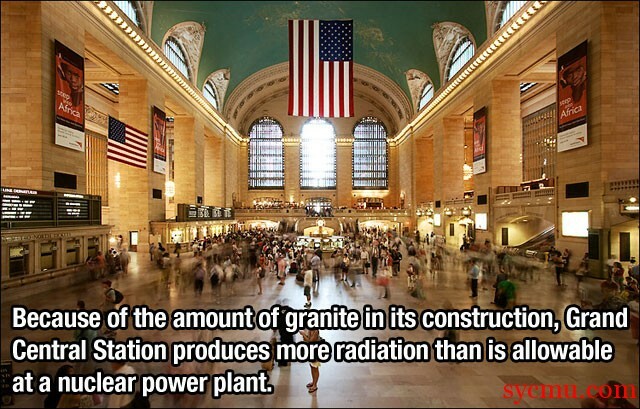 Studies show that because of the amount of granite used in the construction of the Grand Central Station, it produces more radiation than is permissible at a a nuclear plant. The Grand Central Station radiation is a serious issue, and is produced because of the uranium content in the walls. This Article shows that the employees at the Grand Central Station are exposed to 120 mrem of radiation. And by the way, did we mention that smoking is bad for you? 16,000 millirems of radiation bad!